I experiment a lot with different window managers on my boxes from the obscure to the very latest. 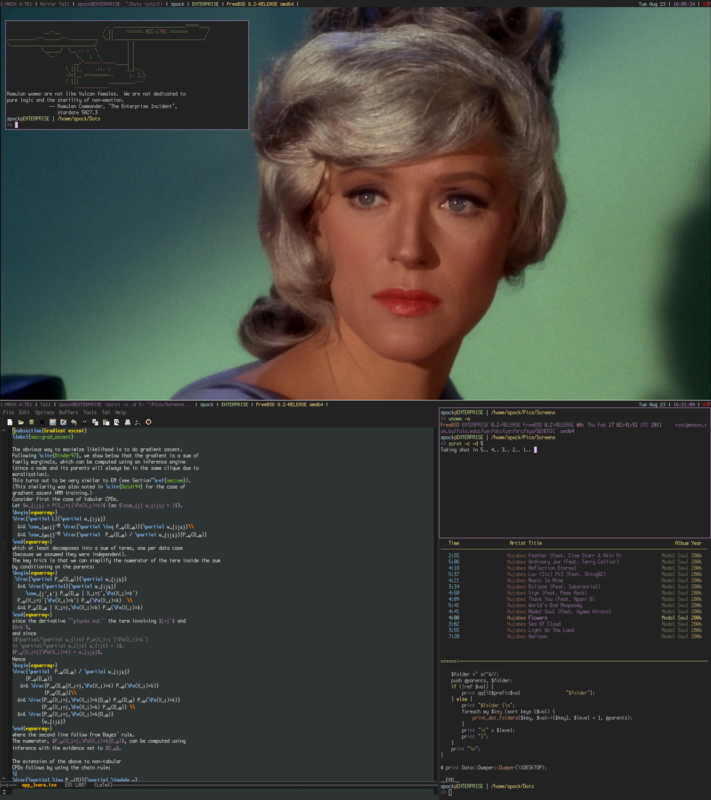 On my DragonFly BSD box, I use nothing more than TWM, themed of course. On my OpenBSD powered EEE PC, its either CWM or ScrotWM. 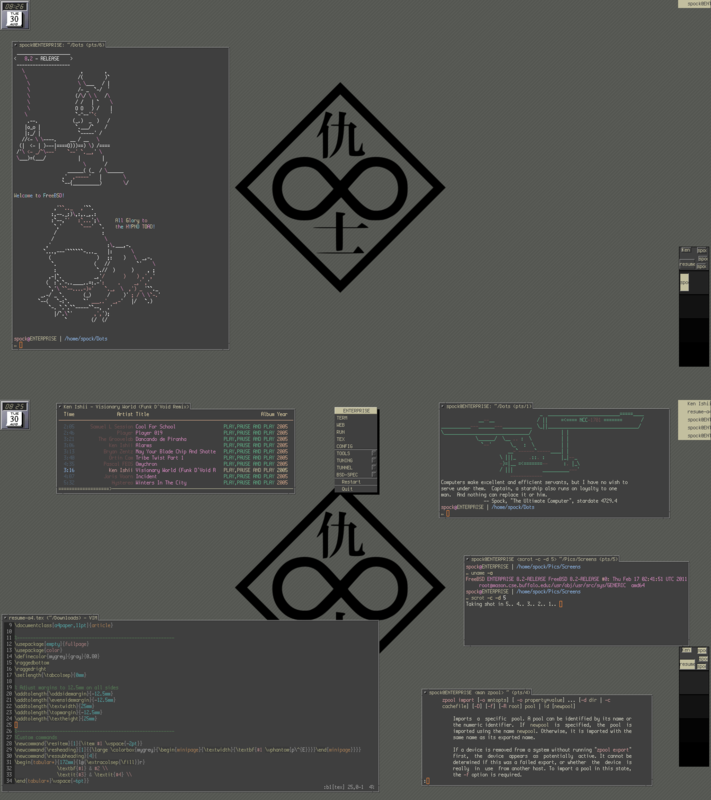 On my desktops, just EvilWM and on my FreeBSD powered laptop, I alternate between XMonad, Fluxbox and CTWM. For a while, I wasn’t using XMonad, but last month, started hacking Haskell, so thought of installing XMonad. I use a very simple, highly functional config from Sterling Camden. I configured it for my needs and it fits the bill perfectly. Every workspace is modeled according to the apps that are supposed to be active in those areas and the window management ratios are controlled accordingly. The status bar is drawn by Xmobar, again a faithful adaptation of Camden’s .xmobarrc. 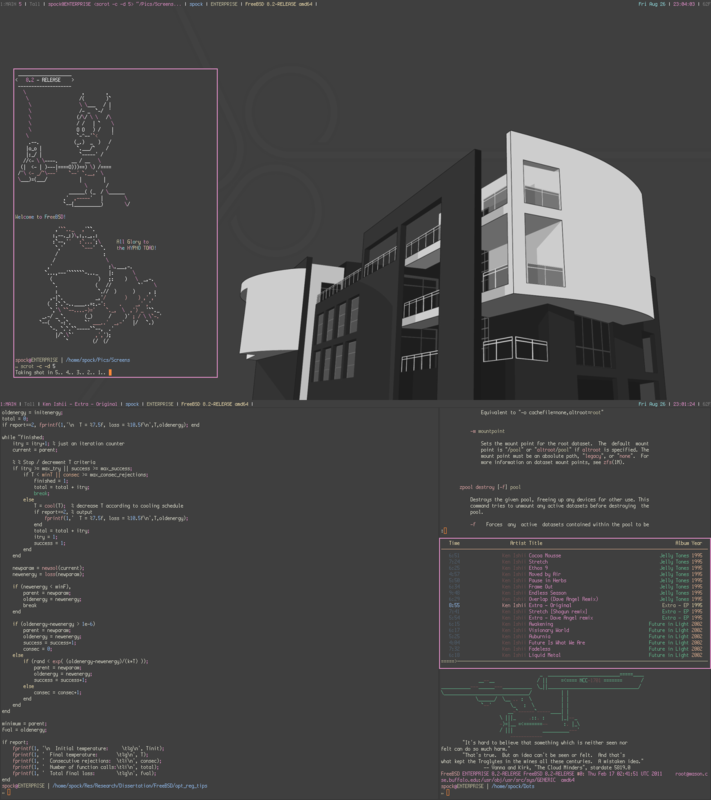 Here are a couple of XMonad screenshots on my FreeBSD laptop. Click on the thumbnails for original sizes. 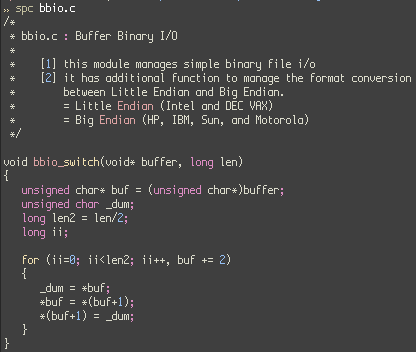 The colors come from Lich’s low contrast theme and the emacs color theme is tangotango. Font is boxxy, a mod of Terminus, posted by caffeinebasedlifeform in Arch forums. 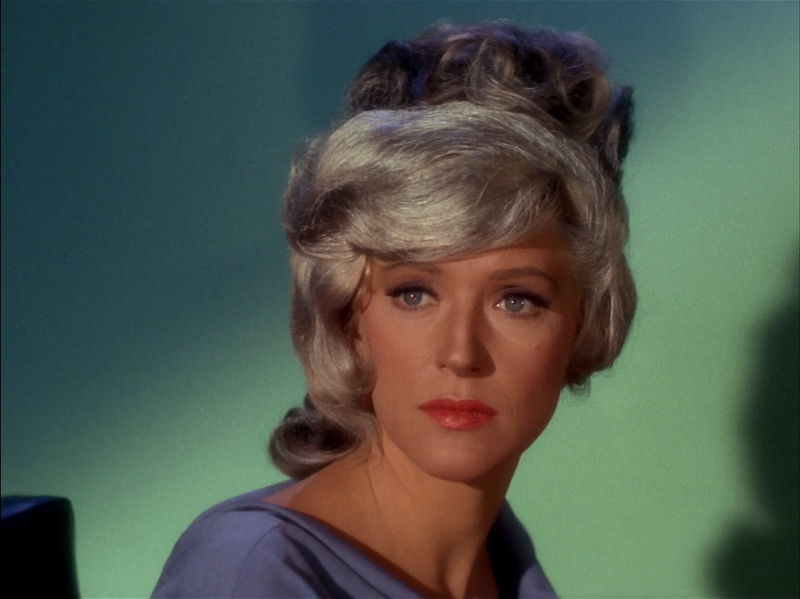 The background is of Goddess Christine Chapel from Star Trek Original Series Episode, The Naked Time. Here is Late Mrs. Roddenberry’s picture for anyone interested. Colors are Zenburn inspired. Font is Boxxy as usual. The wallpaper is Block from customize.org. Fluxbox takes care of my non tiling needs mostly. But gave into nostalgia last night and started using CTWM on this machine for the moment. Quickly threw together a zenburn inspired ctwmrc, based on the noir theme. Menu and keyboard shortcuts give me a quick access to BSD specific tools that I use quite often. Chose a color gradient to differentiate the workspaces and asclock takes care of time display. Wallpaper is a quick mod of Clearlooks based wallpaper that I got from DevArt, with the logo of Individual Eleven from Ghost in the Shell slapped on. If you want the wall, please let me know. Click on the thumbnail for original size. Here’s the wall mod if anyone is interested. Feel free to post your queries. Just wanted to add – If you wanna convert the flac files from a couple of posts earlier to mp3, you can easily do this on the command line quick and dirty (in Unix). All you need is flac and lame. I have a very old mp3 player that I still use, so it helps to have mp3s. Just change to the directory and issue the following command. I will post some screenshots later tonight. 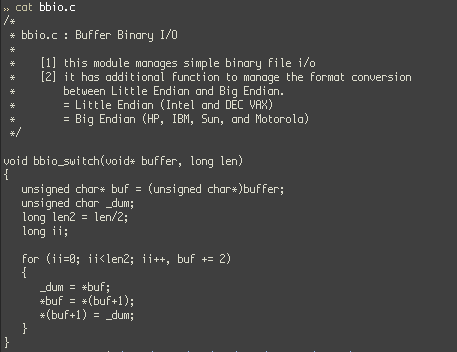 If you had followed my screens at various *nix forums, you would know that I use BSD Unix exclusively now. It was a choice that was born out of some issues with Linux. I will expand on it later. I have donated my entire old computer collection to an Old Age Home. So, now I own a couple of laptops, an EEE 1000H an EEE Top and a couple of desktops. All computers run different BSD variants. As promised, please follow the link for Sensations of Tone album by G.O.L. 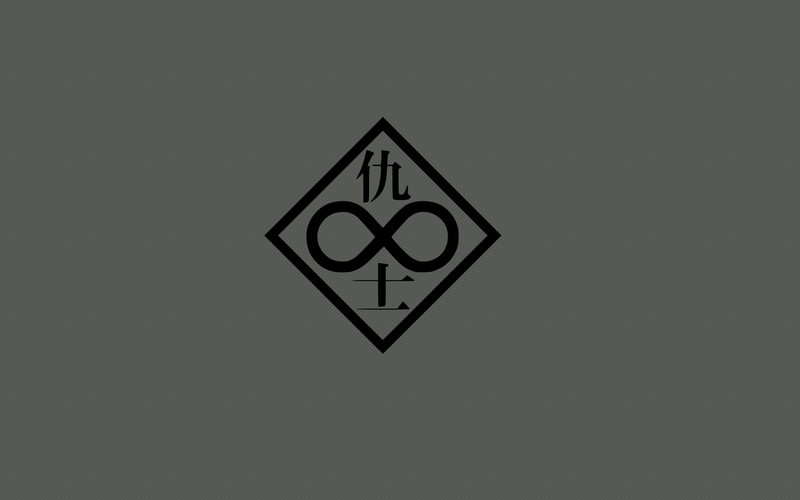 I have uploaded the original .flac files over at megaupload (zip archive). The file is password protected. I will give a clue for the password. It is a name (no caps) and it is of a Romulan commander of IRW Valdore, a Romulan Warbird. She appears in Star Trek Nemesis. It shouldn’t be difficult to figure it out. Please let me know if there is any difficulty. Well, here we go again! I am sorry for having vanished since my last post in May. Work and other issues took precedence and hence, couldn’t really post a lot. Anyway, this is what I am planning to do. I will post a lot of stuff over this weekend. Trust me, this time I mean it. I had long uploaded the Sensations of Tone Album but I have to look up the download links on my other computer. So apologies for anyone who come here looking for the album and not finding it. Life goes on as usual. Career wise, things are looking good, but personal life can be much better. It’s been a little more than six months since experiencing the heartbreak and I honestly do not know how long it’s gonna be like that. I have stopped analyzing the reasons for it and have somehow come to accept it rationally. But this experience has also changed me. Now I look at most things only from a rational/logical standpoint. Other modes of vision do not exist anymore. Just a word of advice to people who are planning to end a relationship. If there is a problem, please address it immediately. Do not string people up for months or years by never letting the other person know that there are some issues. I don’t understand why it would be difficult to talk when such a situation arises. What also beats me is how someone who has not revealed such a thing proceeds to suddenly finish things off and leave one day. It happened in my case in all of two hours. Imagine how painful it would be. Anyway, sorry about rambling. Come back for updates this weekend.